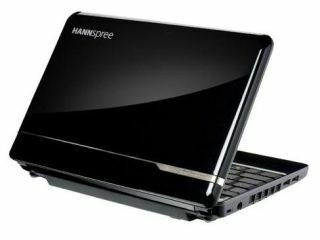 HANNspree's foray into the netbook market, the HANNspree HANNSnote, has gone on sale in the UK for £259.99. The manufacturer, best know for its novelty televisions, has announced that the HANNSnote is available now, with the Atom-based 10-incher likely to face an uphill struggle in a crowded and competitive market. The 1GB machine has an Atom N270 1.6GHz processor, has Bluetooth, WiFi and, according to HANNspree, a full size keyboard. What Laptop points out that the netbook is 'effectively a rebranded MSI Wind' in its review of the HANNspree HANSnote. "This mini footprint is enhanced with two stylish glossy finish options, glossy pearl black and glossy pearl white, to create a sleek, sophisticated look for the fashion conscious gadget lover," adds HANNspree.